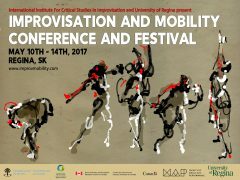 The Improvisation and Mobility Conference and Festival, held at the University of Regina May 10-14, blended keynote presentations, creative performances and immersive experiences, panel conversations, and group workshopping to keep participants engaged, curious, and stimulated. There were keynotes by Vida Midgelow, Frédérique Arroyas, and George Lipsitz, as well as “An Interview with Two Leading Improvisation Scholars,” featuring Ajay Heble and Dr. Lipsitz. Panelist Rick Kotowich, a long-time community educator and IICSI collaborator, reflected, “For me this conference stands out as one of the very best collective learning experiences of my life (on so many levels).” For a full schedule of events and participants, see below. Elizabeth Jackson, who attended the conference, was “struck, again and again, by the depth of connection, inquiry, and impact that Regina’s diverse team has grown together.” Congratulations to the organizers and participants of this landmark event in Canadian improvisation studies! The Regina Improvisation Studies Centre, which is the Regina site of the national SSHRC Research Partnership the IICSI, together with the Faculty of Media, Art, and Performance at the University of Regina, hosted the the Improvisation and Mobility Conference and Festival, held at the University of Regina, Regina, Saskatchewan, Canada, and downtown Regina art venues. The program explored themes of improvisation and mobility, and includes lectures, performances, hybrid performative talks, workshops, installations, the launch of interactive apps, and much more. A special project “The Prairie Heartbeat Schools Project” connected local public schools in Regina to produce performances and workshops on themes of improvisation and cultural identity. We are very grateful to the Social Sciences and Humanities Research Council of Canada, who sponsored a special theme exploring improvisation and social isolation. Entitled “Improvise Mobilize,” the events in this series of events throughout the conference brought together researchers, students and community organizations to explore the potential for improvisation to support social change at the community level. Look for the “Improvise Mobilize” label on the schedule to identify these events. Keynote presenters include George Lipsitz, Ajay Heble, Vida Midgelow, Isabella Stefanescu, and Frederique Arroyas. We are interested in the connections between critical studies in improvisation, contemporary improvisatory practice, and concepts of artistic, physical, technological and cultural mobility. Presenters were drawn from the fields of dance and performance studies, theatre, community-engaged art and music, ethnomusicology, creative technologies/new media art, intermedial studies, and critical studies in improvisation. How (and why) do improvising artists and scholars of improvisation engage with mobility in and through their practice? How can notions of real-time decision-making, risk, collaboration, active listening and the reconfiguration of mistakes into productive material model new types of engagement with difference and culture, through new kinds of mobility? What are the new possibilities for improvisation opened by the ubiquity of hand-held mobile devices and new types of mobile interfaces for creative expression? What are the possibilities for intersections between literatures and practices in somatic work, disability cultures, and improvised movement and performances? Who is brought in, and who is left out, when improvisation mobilizes? What are the possibilities and issues with improvisatory mobilization across disciplines? 3:30-4:00 – Closing Round-table: Where can we move to now?